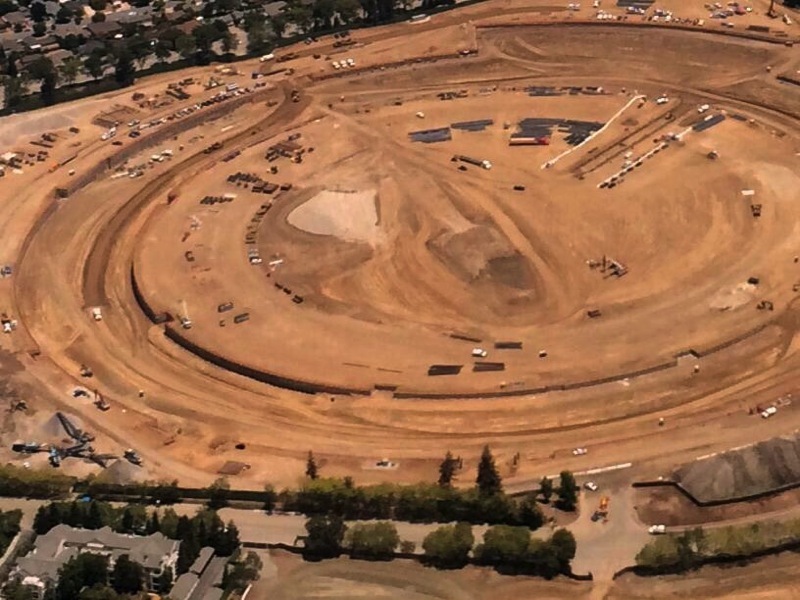 Construction at Apple's Spaceship campus continues, with the circular building beginning to take shape according to an image posted to Twitter by KCBS news and traffic reporter Ron Cervi (via 9to5Mac). In the most recent shot, a wall has been built around the perimeter of the building, outlining where the foundation will be poured. A different tweet by @DawnMortensen notes that Pruneridge Avenue, a road that runs through the campus itself, has been permanently closed. Street-level photographs back in December revealed several buildings still standing, but another aerial photo from February suggested a large portion of the demolition work had been completed. During construction, Apple has closed off sidewalks and built a large green privacy fence to keep the area hidden. Cervi has been posting a number of images of the campus over the past few months, tracking the progress of construction. Campus 2 is expected to open in 2016.
wow those homes are so close. I'd be kinda bent about that. Their property value gonna jump. Lots of rich techies would love to be able to walk to the office. It's going to be a huge greenspace, park like, and open. Will be some light retail, cafe, etc. Just a mess during construction. I'd gladly tough it out. Wow those 'tiny' trucks really give you a sense of scale of the whole thing. I hope we get some decent photos of the inside and out when it's completed, since I'm never going to be able to go in person haha! You prefer the asphalt and boxes it is replacing? The HP campus went right up to the streets on every side. Nice, looks pretty impressive. I expect endless polo mint jokes will follow it's completion haha. But where are they going to park 15,000 cars? I believe that's the number of employee's they expect to work there. Have they already dug out and finished the secret underground bunker? I'm going to venture a guess in that the contractor didn't do all that themselves. They probably subcontracted that job out to a company that rents out fences, and that company's employees put those fences up. No reason to nitpick that type of statement. The way it read, I had visions of Apple employees in their black t-shirts and name tags building construction fences and setting up sidewalk barriers. Even the concept of "building a fence" is sort of amusing. It's disgusting how much tax payer money and power these spying agencies are allocated. All to spy on their own citizens and the citizens of others.